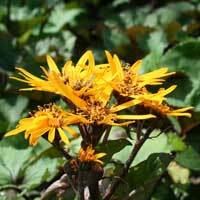 This plant sports huge chocolate tinted leaves with burgundy undersides, masses of dark yellow-orange flowers and a love for moist, shady conditions. The herbaceous perennial is native to China and Japan and forms impressive clumps in the garden. 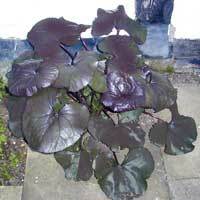 The heart-shaped to roundish, dark leaves are produced on black to dark purple long petioles and are as attractive as the flowers. 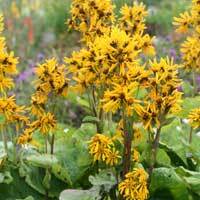 Long stalks rising well above the leaves hold masses of shaggy, daisy-like flowers in flat-topped loose groups. Flowers are produced in the summer. 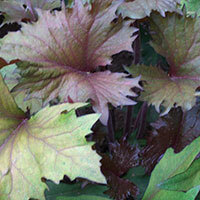 This plant is such a familiar form dentata abnormal with striking brownish purple leaves. This breed is considered one of the best cultivars considered. A compact plant producing heads of vivid orange flowers on stiff stems above a good clump of large, leathery purple leaves that are mahogany beneath. 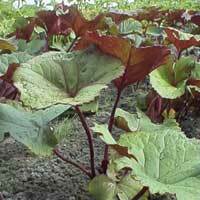 Will grow in sun or semi-shade in a moisture retentive soil. This is such a famous and much-planted dentata abnormal shape with prominent brownish leaves. This is a recent innovation in England with a coarser leaves than the species. 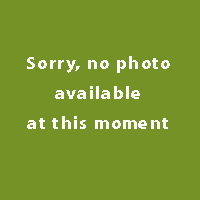 A rowing race out strong with round, green leaves and orange flowers. Leathery, serrated leaves vary in color from olive green, black, purple to bronze. Sulphur yellow blooms. Large round toothed leaves of a medium green with a bit of olive tone. Golden-yellow flowers in late summer. It’s nice - and does well in the shade garden. 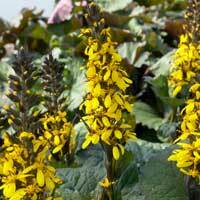 A smaller Ligularia with fascinating cut foilage, providing a tropical look in cold climate gardens. 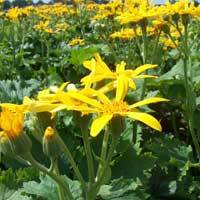 Fringed yellow blossoms adorn almost black stems.Thrives in moist soil. One of the newer varieties with deep yellow flowers and red stems. 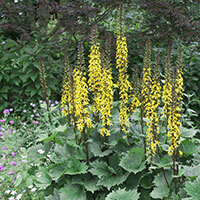 Short growing variety with spires of yellow flowers.